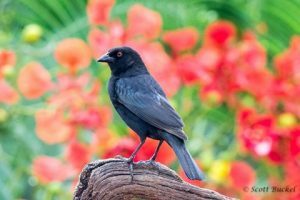 A lot of people hate Bronzed Cowbirds, as they are well-known brood parasites and lay their eggs in the nests of songbirds. They don’t take care of their young, and their chicks will actually push out their nest mates so that the young cowbird gets all of the food. Ensuring the next generation of cowbirds and not allowing for the next generation of small song birds. This entry was posted in Wildlife by Scott Buckel. Bookmark the permalink.